Merry and Blessed Christmas to All! It doesn't exactly capture the Middle East, but it is a lovely and reverent Czechoslovakian creche display that does encapsulate proper reverence for the reason for our season. 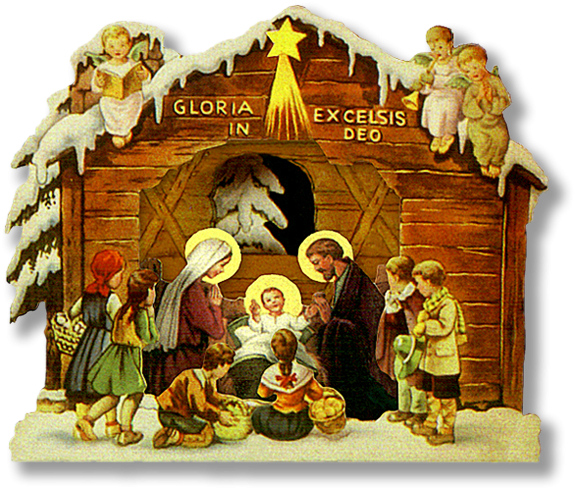 Merry Christmas to all and consider visiting the website providing this lovely Christmas art work. According to a story appearing this morning in the WASHINGTON POST, Christians in India are undergoing severe trials. Churches have been burnt, forced and bribed conversions are being attempted by Hindu nationalists. That account suggests the persecution may have the Indian prime minister's blessings. However, another recent story suggests Indian Prime Minister Narendra Modi ordered the campaign against Christians to be called off. Which is true, I do not currently know. Today's Washington Post article is later in time.
. . . His [Ajay Joseph, 39, a Christian lab technician] fears echo those of other religious minorities in majority-Hindu India, where some Christians and Muslims worry that incidents of religious tolerance will rise with the advent of a conservative government led by Narendra Modi, himself a fervent Hindu nationalist. In recent days, carolers have been beaten in the southern city of Hyderabad, and a Catholic church in New Delhi burned in a suspected case of arson. A conservative Hindu group said Wednesday that another mass “conversion” event would be held in February. India’s 64-year-old prime minister has a troubling history of religious intolerance, opponents say. In 2005, while he was chief minister in the state of Gujarat, the United States revoked Modi’s U.S. visa on the grounds that he had committed “severe violations of religious freedom” by not acting to stop Hindu-Muslim riots in Gujarat in 2002. These are all intensely disturbing developments. Further, I cannot help but wonder if they are developments that will be used to help justify a forced New World Religion -- a long time goal of New Age planners that I encapsulated in my 1983 book THE HIDDEN DANGERS OF THE RAINBOW. These are trying times for the faithful to be sure. We must remember Jesus Christ's injunction: Be ye faithful unto death and I will give you a crown of life. May God be with the Indian Christians and all who are facing persecution world wide for keeping the faith. Did you know there is now a new global governance type initiative? It is called the GLOBAL INFRASTRUCTURE INITIATVE? Javier Solana reported as a global sign of hope in his November 29th Project Syndicate article. The link supplied in his article is bad, but here is a good link to that Initiative. The project is projecting a required investment of $3 Trillion US dollars equivalent ANNUALLY. Query, how will that amount, should their initiative be "successful" be raised? Do you see any way out besides a global tax? I don't! According to Javier Solana, the GLOBAL INFRASTRUCTURE INITIATIVE will "will create a Global Infrastructure Hub to serve as a knowledge-sharing platform for governments, the private sector, development banks, and international organizations. . . ."
More objects are becoming embedded with sensors and gaining the ability to communicate. The resulting information networks promise to create new business models, improve business processes, and reduce costs and risks. March 2010 | byMichael Chui, Markus Löffler, and Roger RobertsIn most organizations, information travels along familiar routes. Proprietary information is lodged in databases and analyzed in reports and then rises up the management chain. Information also originates externally—gathered from public sources, harvested from the Internet, or purchased from information suppliers. But the predictable pathways of information are changing: the physical world itself is becoming a type of information system. In what’s called the Internet of Things, sensors and actuators embedded in physical objects—from roadways to pacemakers—are linked through wired and wireless networks, often using the same Internet Protocol (IP) that connects the Internet. These networks churn out huge volumes of data that flow to computers for analysis. When objects can both sense the environment and communicate, they become tools for understanding complexity and responding to it swiftly. What’s revolutionary in all this is that these physical information systems are now beginning to be deployed, and some of them even work largely without human intervention. Pill-shaped microcameras already traverse the human digestive tract and send back thousands of images to pinpoint sources of illness. Precision farming equipment with wireless links to data collected from remote satellites and ground sensors can take into account crop conditions and adjust the way each individual part of a field is farmed—for instance, by spreading extra fertilizer on areas that need more nutrients. Billboards in Japan peer back at passersby, assessing how they fit consumer profiles, and instantly change displayed messages based on those assessments. McKinsey & Company get around. According to Huffington Post, even the Vatican has engaged them as a consultant. Cognizant Reports has issued an on line available report on the "Internet of Things". You may obtain it from clicking here. When James O. McKinsey founded McKinsey in 1926, he could not have imagined the reach his small firm would eventually have. Eighty-five years later, the firm has grown into a global partnership serving two-thirds of the Fortune 1000. A 1993 profile story in Fortune Magazine said McKinsey & Company was “the most well-known, most secretive, most high-priced, most prestigious, most consistently successful, most envied, most trusted, most disliked management consulting firm on earth.” According to BusinessWeek the firm is "ridiculed, reviled, or revered depending on one's perspective. "McKinsey's culture has often been compared to religion, because of the influence, loyalty and zeal of its members. Fortune Magazine said partners talk to each other with "a sense of personal affection and admiration." An article in The News Observer said McKinsey's internal culture was "collegiate and ruthlessly competitive" and is sometimes described as arrogant. The Wall Street Journal said McKinsey is seen as “elite, loyal and secretive.” According to Reuters it has a "button-down culture" focused on “playing by the rules”. According to BusinessWeek, “some observers” say that McKinsey has started to lose touch with its founding principles and become less personal as its size has increased. The Guardian said at McKinsey “hours are long, expectations high and failure not acceptable.” Fortune and USA Today both noted that the majority of McKinsey's consultants are white men. Well, I've just learned and plan to study more about this significant globalization initiative which might well ultimately affect both our pocketbooks and freedoms. It decidedly is "on the move" while we seem to focus on "news" more often bordering on soap operas. I'm keeping a wary eye on it. You should too.